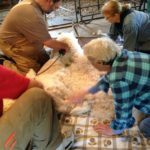 Visit the farm on shearing day to watch the alpacas get their annual shearing. May 24 from 1:00 – 5:00 p.m. Contact us at mvfalpacas@gmail.com to let us know you plan to come by and we’ll firm up the time with you as the date gets closer.